MEDINA, MN--(Marketwired - Dec 9, 2013) - Indian Motorcycle®, America's first motorcycle company, announced today it is donating a one-of-a-kind custom 2014 Chief Vintage motorcycle to support "Operation Ride Home," a partnership program between Jack Daniel Distillery and the Armed Services YMCA designed to help junior-enlisted service members and their families travel to their homes across the country this holiday season. For 2014, the inaugural year for the new Indian Chief built in Spirit Lake, IA, the first 1,901 units were specially badged with commemorative serial numbers. The 'No. 7' serial number off the line was a Red Indian Chief Vintage model donated by Indian Motorcycle to the "Operation Ride Home" program which will benefit military families. The talented artists at Klock Werks in Mitchell, SD led by Brian Klock added just the right touches to create a truly unique motorcycle. Hand-laid pin striping, Jack Daniel's logos, the Operation Ride Home logo and a customized seat combine to reflect the special nature of this custom motorcycle. The No. 7 Operation Ride Home custom bike was unveiled to a standing-room-only crowd of press and dignitaries at the International Motorcycle Show in Long Beach on Friday, December 6. On-hand for the moving unveiling ceremony were U.S. Marines Lance Corporal Johnny Cornejo, Jr., a beneficiary of Operation Ride Home program, and John Baer, San Diego chapter board member for the Armed Forces YMCA. "For the third year in a row, we are honored to play a leadership role in sponsoring this important campaign in support of the fiercely loyal men and women of our Armed Forces and their families by helping assist those members who otherwise might not be able to spend precious time with their families over the holiday season," said Dave Stang, marketing manager for Jack Daniel's. "We anticipate an even greater outpouring of support for this campaign in 2013 and we sincerely welcome the partnership and support of our friends at Indian Motorcycle." The bike will be auctioned by Barrett-Jackson, one of the world's leading auctioneers of classic vehicles, at its Scottsdale, AZ auction, which runs January 12-19, 2014. The Serial No. 7 Indian Chief Vintage motorcycle will be on display at the upcoming International Motorcycle Shows tour, which begins December 6 in Long Beach, Calif., where tens of thousands of motorcycle fans will have a chance to view it. Proceeds from the charity auction, which are likely to amount to several times the 2014 Indian Chief Vintage's $21,399 MSRP, will be donated to support the "Operation Ride Home" program administered through the Armed Services YMCA. To follow the auction or to register as a bidder, log on to http://www.barrett-jackson.com/scottsdale/bid/. "All of us at Polaris Industries are proud of our decades-long support of our U.S. Armed Services personnel and their families, and the Indian Motorcycle brand has an even longer heritage of supporting the United States military dating back to World War I," said Steve Menneto, vice president of motorcycles for Polaris. "Today we are pleased to extend that relationship by partnering with our friends at Jack Daniel's and the Armed Services YMCA in support of Operation Ride Home. The Old No. 7 label in black and a red Indian Chief are two of this country's most iconic symbols, so we are honored to donate the No. 7 unit of our history-making new 2014 Indian Chief motorcycles for the benefit of our hard-working and dedicated military personnel and their families." Officially registered by the U.S. Government in 1866 and based in Lynchburg, Tenn., the Jack Daniel Distillery, Lem Motlow, proprietor, is the oldest registered distillery in the United States and is on the National Register of Historic Places. Jack Daniel's is the maker of the world-famous Jack Daniel's Old No. 7 Tennessee Whiskey, Gentleman Jack Rare Tennessee Whiskey, Jack Daniel's Single Barrel Tennessee Whiskey, Jack Daniel's Tennessee Honey, Jack Daniel's Tennessee Whiskey-Based Ready-to-Drink Beverages and Jack Daniel's Country Cocktails. Jack Daniel's encourages its friends to drink responsibly. The non-profit Armed Services YMCA (ASYMCA) provides no and low-cost programs to make military life easier for nearly 500,000 active-duty enlisted military and their families each year at 31 branches and affiliates nationwide. Innovative direct services are tailored to the needs of local military installations nationwide with the help of 13,000 volunteers in addition to community and military support. The ASYMCA was rated in the top 2% of charities nationwide by Charity Navigator in 2012. Of the 1.2M Active Duty military stationed in the US, approximately 82% are located where the ASYMCA has a Branch or Affiliate nearby to help make military life easier. The ASYMCA does not receive government funding, and does not charge dues or membership fees for their programs. Your tax deductible donation (Tax ID #36-3274346) to the ASYMCA, a top-rated non-profit, will make a significant difference impact on the lives of enlisted service members and their families. Please visit asymca.org to learn more. 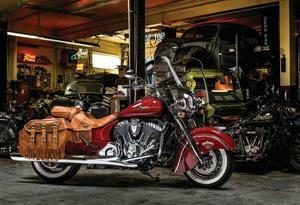 One-of-a-kind custom 2014 Indian Motorcycle Chief Vintage to support "Operation Ride Home"